We would like ASAP members to host panel sessions for this upcoming conference. If you are planning on proposing a panel please do contact the DSA directly but please do also let me know so we can co-ordinate efforts to publicise and support you. There will be a later call for papers which will be shared in due course. The annual conference of the Development Studies Association will take place from 19-21 June 2019 at The Open University and will focus on ‘Opening Up Development’. The Call for panels and roundtables for this conference is now open! 2019 marks the 50th anniversary of The Open University and so we hope you will be able to join us for this special event. Please visit the conference website homepage, read the conference theme and then head to the call for panels page where you can make your panel and roundtable proposals using the online form. There is also an option to propose more experimental/alternative panel formats this year, so do take a look at the options available. The deadline for proposals is 14 November 2018. 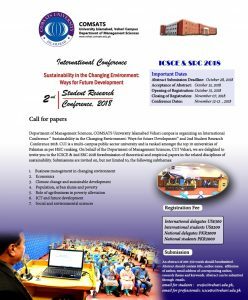 The Department of Management Sciences, COMSATS University Islamabad, Vehari campus is organising an international conference on ‘Sustainability in the Changing Environment: Ways for Future Development’ on 12-13 November 2018. We have a fantastic opportunity to hold an ASAP panel session in April at the Economic and Social Development Conference at HSE (Moscow). Information about the conference is below. Can potential participants submit an abstract here: https://conf.hse.ru/en/ first and after that write to dtolkachev@hse.ru to notify the organisers that application have been submitted before 1st November. We have a short time before the official deadline to apply for our session for ASAP. Thank you. The National Research University Higher School of Economics (HSE) with the support of the World Bank will be holding the 20th April International Academic Conference on Economic and Social Development. The Conference’s Programme Committee is chaired by Professor Evgeny Yasin, HSE’s Academic Supervisor. Participants are invited to submit extended abstracts of their papers for presentation at the Conference’s sessions. Proposals must be submitted through HSE’s online system at https://conf.hse.ru/en/ until November 12, 2018. The Programme Committee will then send notifications on the acceptance of proposals (by January 25, 2019), after considering the results of reviews carried out by independent experts. Online registration to attend the Conference will be open until March 25, 2019. Information about previous conferences can be viewed here https://conf.hse.ru/en/2019/. Additionally If you interested in gender or queer theory please also write to me and Valeriya Utkina UtkinaVV@hse.ru . There is another session being hosted.